"The Lord God took the man and put him in the Garden of Eden to work it and take care of it." Throughout history, people have fallen into a trap of dualism. Christians have created this dualism by separating the holy from the unholy. Traditionally, those involved in full time ministry, the works of the church, and missions were considered "holy" or "religious" while others involved in the so-called "secular" or "earthly" works were considered "unholy" or "less than religious." All work, as long as they do not violate the character of God, is holy, set apart for Him, His Kingdom and His glory. Humanity has distorted God's creation, purpose and will through sin. Jesus, our Savior and Lord, has reconciled His believers to God the Father through His redemptive death and resurrection. We, as saved believers, are called to a duty as ambassadors of Christ for the ministry of reconciliation. It is God's intent to bring all things in the world to be reconciled to Himself. (2 Corinthians 5:17-20) All things, not just seemingly holy or religious things. The BAM movement restores God's original design and purpose for business and to anoint it to be a channel of God's blessings in full integration with God's mission. It is NOT a business as usual, a mission as usual, a fake business, a profiteering, a Christian-owned business or a business for mission. The BAM movement IS, however, a business with a clear mission aligned with the Great Commission, a profitable and sustainable real business, a business that takes a holistic approach and produces holistic transformation in the lives of people a business serves. It is time for business men and women to arise and shine in response to the Lord's great calling. Let us bring the gospel to all nations, particularly remaining strategic mission frontiers! SfK Life Corporation held its board meeting on March 8th. SfK Thailand will hold its first Missional Business Management Training (MBMT) from March 26th through April 30th. The training will take place in Bangkok all day on Saturdays and for three hours on Tuesdays, Wednesdays and Thursdays. The MBMT will cover biblical foundation to BAM, historical background of BAM, biblical principles of management and leadership, management skills, leadership, business plan workshop etc. Jeffrey will lead the training course. 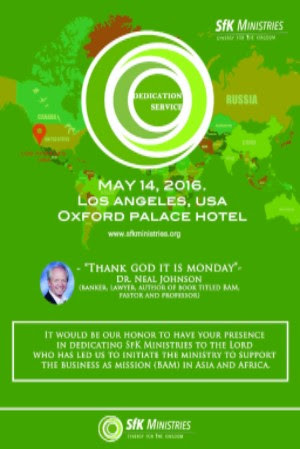 SfK Life Corporation will dedicate the ministry to the Lord on May 14th, 2016 in Los Angeles. All board members, several Kingdom Fellows and prospective supporters will join us in this service. Dr. Neal Johnson, a pastor, a banker, a lawyer, a professor and author of many books including B.A.M. will deliver the message. SfK Korea is taking shape. SfK Korea will manage a BAM Fund to be established in Korea in 2016. During the MBMT Bangkok, Jeffrey will explore the possibilities of expanding SfK ministries within Thailand to other cities throughout Asia. Please pray that these endeavors will be fruitful. Please join us in prayer for God's mercy and grace upon the Dedication Service in May. SfK Life Board will hold its strategic planning session on May 14th. Please pray that this strategic planning session will produce a strategic plan that will set the direction and the course for SfK Ministries. We continue exploring the best ways of using Salesforce.com as a CRM solution for SfK's database management. Please pray for God's divine wisdom in this research and exploration process. Please pray that all staff and Kingdom Fellows will remain faithful to the calling and that the Lord will provide for all resources that SfK Ministries will require for carrying out the mandates. March 26, 2016-May 1, 2016 - Missional Business Management Training (MBMT) in Bangkok, Thailand with 12 business entrepreneurs. May 7, 2016 - Lecture by Jeffrey Lee, "Microfinance for Sustainable Development" and a presentation about SfK Ministries in Seoul, Korea. May 14, 2016 - SfK Life Board strategic planning session and regular board meeting in Los Angeles, California. May 14, 2016 - SfK Life Corporation's Official Launch and Dedication Service in Los Angeles, California. All board members, several Kingdom Fellows and prospective supporters will attend. If you would like to be invited, please let us know via e-mail to info@sfklife.org.